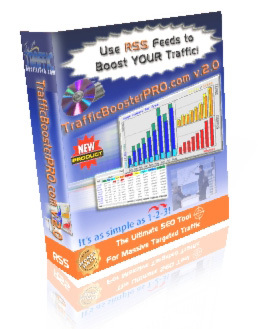 TrafficBoosterPro SEO Tool - Marketing Software - RSS Feeds. Self Growing Intelligence Web Sites builder.TrafficBoosterPro comes to online market with a Marketing tool and SEO tool that turns any web site into a Self managing unit which evolves with top fineness content, fights for better position in the results of search engines & converts the targeted traffic from search engines into real money. ...... A web site created by TrafficBoosterPro (in less than 2 minutes) can professionally take care of it self & keeps brining profits. TrafficBoosterPro Marketing & SEO Tool Key Features: Pages Created on Server, Multi-language pages creation (Japanese, Korean, Russian, German, Chinese, Greek, etc. ), Embedded Keyword Digger, GEOIP Targeting, Google Sitemap automated, Banner management, robots.txt management, Real Time Statistics, IP Cloaking, User Agent Cloaking, Visitor Cloaking, Link Directory, 24/7/365 AutoPilot creates pages even when you are not there, spy on your competitors, Rank Checker, RSS Randomizer, Content Re-writer, and many more features. No FTP & No MySQL needed. Visit for Demonstration, Learn how websites are getting smarter these days. Feel good with email marketing.email marketing. Qweas is providing links to TrafficBoosterPro Marketing & SEO Tool 2.0 as a courtesy, and makes no representations regarding TrafficBoosterPro Marketing & SEO Tool or any other applications or any information related thereto. Any questions, complaints or claims regarding this application TrafficBoosterPro Marketing & SEO Tool 2.0 must be directed to the appropriate software vendor. You may click the publisher link of TrafficBoosterPro Marketing & SEO Tool on the top of this page to get more details about the vendor.